Onmega Dolphin Therapy Center in Marmaris, Turkey (www.delphintherapie.net) provides day and night, his sea-water pools, including technical equipment and its team of experts (Dolphin trainers, Dolphin veterinears, marine biologists and rescue divers) for retrieval and use for the purpose of rescue and care injured or stranded marine mammals – and Sea Turtles (Caretta caretta) on the south coast of Turkey. 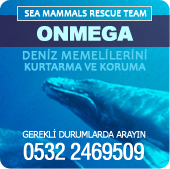 Our professional team is a group of voluntarily helping people, ready to rescue, to salvage (transportation), apply medical treatment and recovery and maintain physical and pshycologic safety for marine mammals which might have been caught, injured or wounded anywhere on the sea or on beaches , until they are ready to get back into the sea,to their homes. The Onmega Rescue Team for marine mammals invites all animal lovers, volunteers, animal welfare organizations, diving schools, marine biology universities, government agencies, donors and sponsors to take place and have benefit on this live platform of protection of marine mammals needs support in Turkey.